I decided to bring DinoBoy to one of his favourite restaurant as a treat because he was sick for the passed week and did not have a good appetite. Also he has been behaving well in school for the passed 2 days with no monkeying or funny business from him. No complains from student care is good news to me. When I told him that we are going to Sakae Sushi for dinner he couldn't believe his ears and asked "You mean we are going to Sakae Sushi? Really???" When I replied Yes to both his questions he was jumping up and down with happiness. 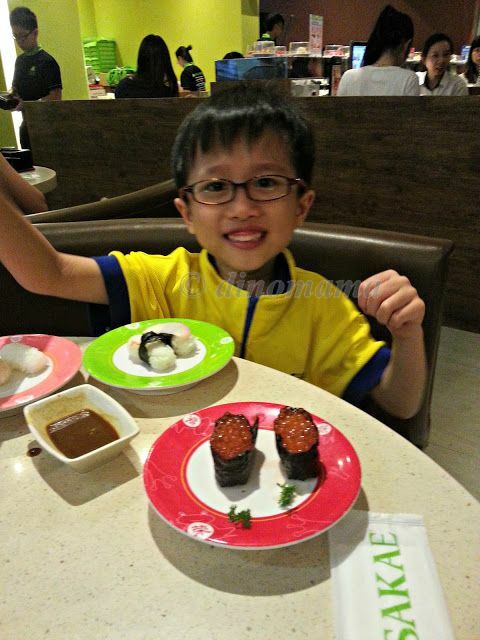 This is because we rarely goes to Sakae Sushi since early 2011 and this little boy loves sushi alot! We have our reasons for not patronizing Sakae Sushi because they are forever crowded, sometimes we have to queue for about 30mins to get a table, the restaurant is always short handed for staffs and their service is only bearable. Every time we are there we tends to block out the irritable look and lack luster attitude given by their staffs. As they are always short handed, sometimes they give us an over tired face, even the smiles they gave us looks fake & forced out. We only go because DinoBoy requests for it, otherwise we could have dine in other places with a happier and more relaxed environment. 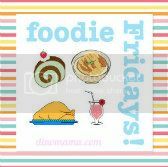 However I see an improvement in the restaurant recently, more staffs in the restaurants and their attitude have changed. Polite and courteous for most of them, even the branch manager looks happier, she is smiling more and even joked with me while I was at the cashier making payment. As for their food, it wasn't fantastic and its not exactly pocket friendly though the food are fresh especially the sashimi. We have tasted better quality food at some other restaurants where the price we paid justify the quality. Anyway, you can see how DinoBoy is enjoying his food on that day. Ika sushi or Ika beard? He insisted me to take a photograph of him with the Ika hanging out of his mouth and send it to Da Yee 大姨 immediately. No idea why he wants to do that, perhaps he is hoping that Da Yee will show it to Cousin Han? He wasn't suppose to eat fried stuffs as he was still heaty & coughing but I was in a lenient & relax mood so I allowed him to eat the shishamo. However I was very pleased with him (& myself) coz after eating 2.5 shishamo he gave me the half shishamo and said he had enough (he usually finishes 4 at a go), cannot eat more as he is still unwell. Its times like these that makes me feel happy and relieve that my disciplines, teachings, nagging and tearing moments are all worth the guilt and heartache. 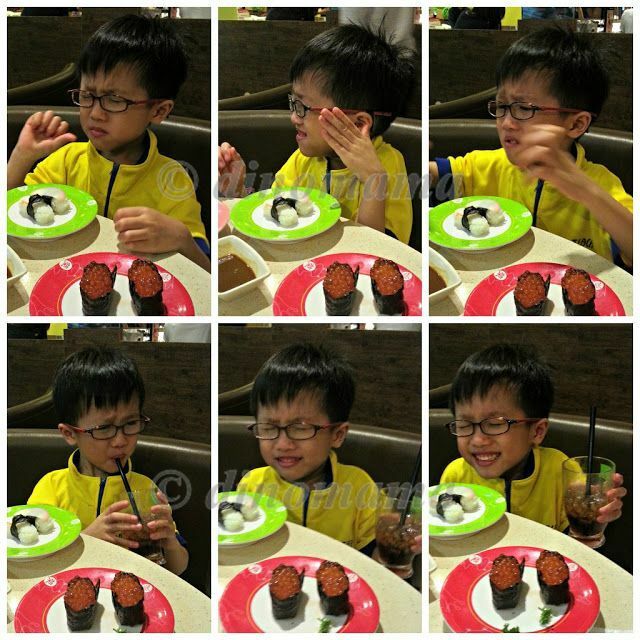 After the wasabi rush where I was laughing & taking photos instead of helping him, he flashes a huge smile showing me that he is ok and then declares that he do not like wasabi anymore. I couldn't stop laughing! Remarks : I am in no way affiliated to the management of Sakae Sushi or have been compensated to write about this. All opinions are 100% based on our experience during our visit. Love to read that Z enjoys his sushi. My kids too love sushi. Kids seems to love them a lot. 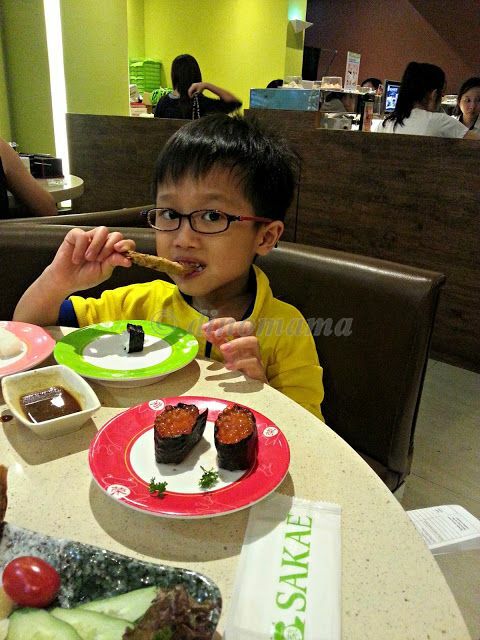 We seldom order sashimi from Sakae, mostly the cooked food and the sushi that DinoBoy likes. Our top place for sashimi & sushi is Genki but recently their quality dropped a bit. 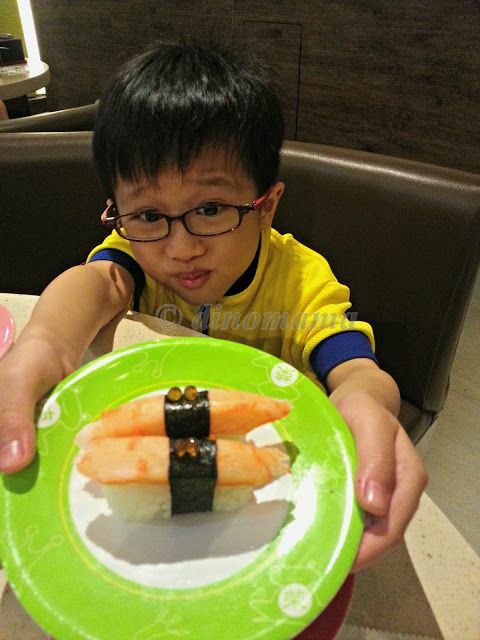 The next place we like to go is Sushi Teh at Thomson. Thanks for letting me know the alternate Japanese restaurants that is worth visiting! Now he don't like it! 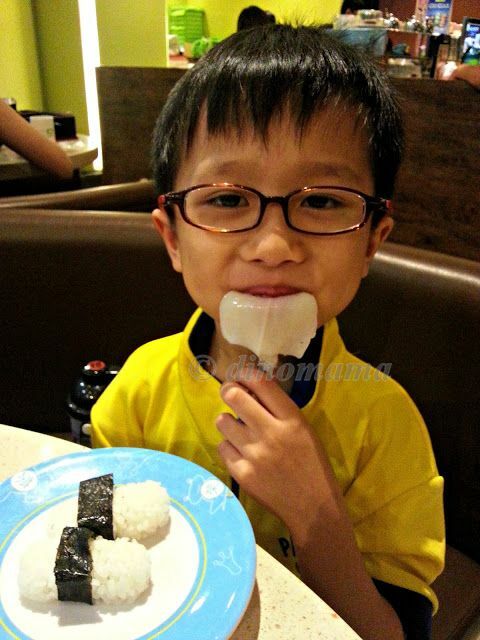 haha~ we'll see when we next have our sushi meal if he really still do not like wasabi. Love the wasabi rush face!!! We also had dinner at sakae yesterday but diff branch. Similarly, it was a special treat cos poppy just recovered from her fever hehe. She loves the chawaushi and the egg rolls! 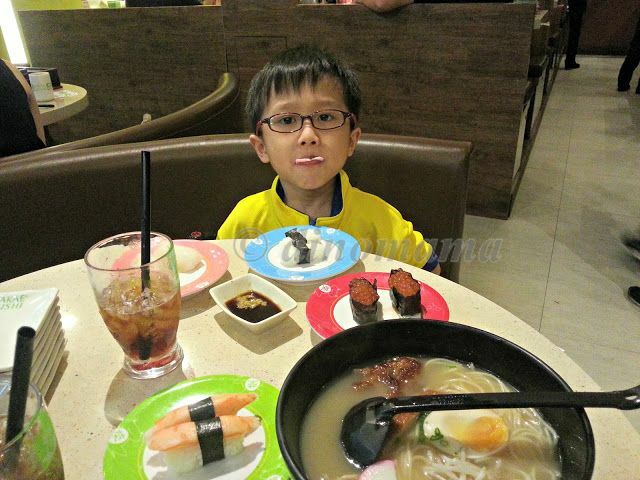 DinoBoy dun like chawamushi any more, dunno why. Such a sweet gesture! Makes you feel guilty for scolding him daily or not? :p *hiding* The series of Wasabi shots - TOO FUNNY!!!! Nope, not guilty. its all worth it haha! Otherwise I'll have a wild horse and have trouble reigning him in. You should see him there and then. I laugh non stop! Bad mummy! Evil mummy.... but that is a real good 60s wasabi rush..... I like his expression!!! Thank you for your compliment =) I think all kids are adorable when they are not trying to get into our nerves hahah!